In July 2003, the volunteers who had worked at the Boggo Road museum for up to 11 years, taking tours and doing general maintenance, formed the Boggo Road Gaol Historical Society (Inc.) as an incorporated association. Their aim was to protect and research the old prison. Ex-officer and museum manager John Banks was the founding president. 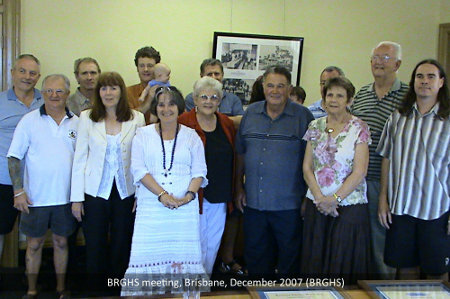 BRGHS volunteers ran successful tours for tens of thousands of visitors, maintained the grounds, installed exhibitions, published books, hosted functions, paid the bills, and it was only through their hard work that Boggo Road was open to the public at all. Although the museum closed in 2005, the BRGHS continued to grow from a foundation membership of ten people to having around 300 members by 2013. These people came from a broad range of backgrounds and include former officers and inmates, local residents, and history buffs. They still hold regular meetings, social events and community stalls while they continue their mission to promote and research Boggo Road. They also lobby government for the best outcome for the future of the heritage prison, and hope to have a significant role there when it is properly reopened. BRGHS' research has diversified to include various aspects of local history, and they continue to build and strengthen their working relationships with other community groups. They still research and publish books, collect artefacts, lobby government, operate the Queensland Prisons Museum in Caboolture, and conduct tours of South Brisbane Cemetery, ensuring that they always have plenty of work to do before Boggo Road reopens again.